The iBootBar controls each outlet independently from Web, Telnet, SNMP and modem. Network access plus out-of-band control via serial port and internal modem with both data and DTMF tone dial control are integrated features. International models support 115/230 VAC with 10 or 20 amp support. Ask us about North American NEMA versions with 15 or 20 amp circuits. The internal modem option allows connection to the iBootBar from anywhere, anytime. Dial-in with a laptop or terminal for complete control of all functions, or access iBootBar with any telephone for quick power on, off or reboot functions. Telephone users are guided with voice prompts and status information. iBootBar continuously monitors the current draw from its outlets and reports user settable high and low current alarms. Know immediately when there is too much load, or a device stops working. Alarms are delivered both by email and SNMP traps. The unique Auto-Ping feature allows iBootBar to monitor any IP device on the network and take automatic action whenever the device is down. Ideal for automatically testing internet connections. The new Heartbeat Detect feature allows iBootBar to monitor any server or PC running either the free Heartbeat Generator Program, or heartbeats integrated into your custom software. Ideal for verifying that specific PCs or Servers are running properly. Multiple users, each with administrator assigned rights only see the outlets they are responsible for. Outlets can be linked together in logical groups, even across managed units, to allow simultaneous power control or reboot with a single command. Groups can also be used to link pairs of outlets together to reboot devices with dual redundant power supplies. 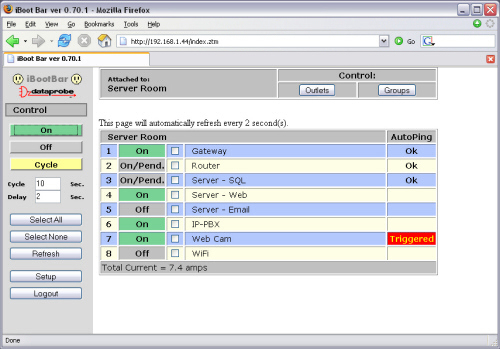 In addition to the Web interface, the outlets can also be controlled via Telnet, Serial, and SNMP.